Baby kiwi is a small, green to purple skinned fruit similar to kiwifruit but having a smooth non-fuzzy exterior. Therefore, unlike kiwi, it does not have to be peeled before eating and can be eaten whole. Baby kiwi is believed to be a native of Northern China, Korea and the Russian Siberia. A deciduous climbing twining vine, 25-30 ft long; often fast-growing; trunks having a catnip like smell which can attract cats; bark brownish with many lenticels. Leaves alternate, simple, unlobed leaves with sharp serrations; 3″ to 5″ long , lustrous, unmarred dark green color ; autumn foliage very late to color and drop leaves. Flowers dioecious, whitish-green with purple anthers; 2 cm across, in clusters at leaf axils, hidden by leaves, fragrant. Fruit a berry, 1 inch long, green to purple skinned fruit much like a miniature kiwi; flavor is similar to the kiwi but often sweeter. The fruit can be eaten full. 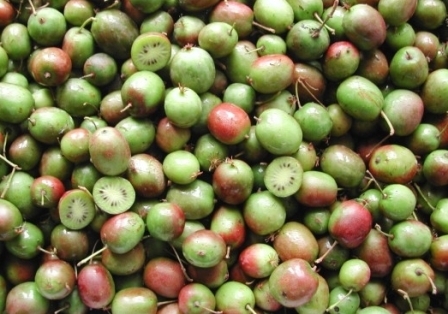 Fruits are eaten raw and these do not have to be peeled like regular kiwifruits. Baby kiwi is rated by many superior in taste and flavour kiwifruit. 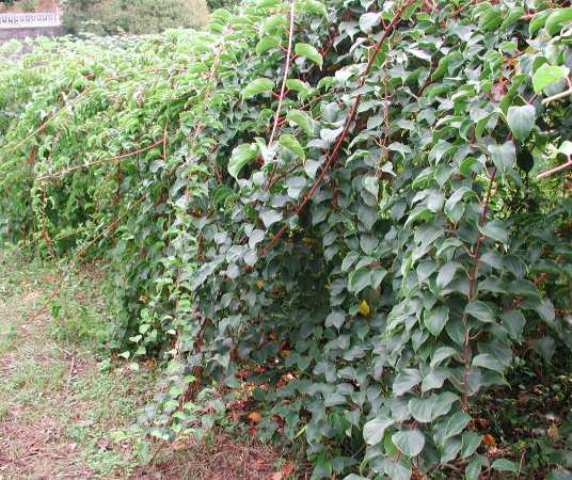 Little kiwi vines require a frost-free growing season of about 150 days. However, late freezes do not affect these. The vines can also be grown in low-chill areas. 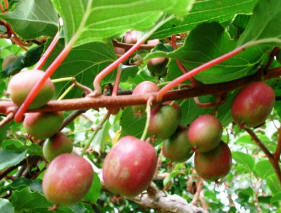 As the plant is very fast growing, relatively infertile soils will suit more for the cultivation of this fruit. Propagation is by mostly by seed. However, asexual propagation from cuttings or grafting is required to propagate varieties. Grafting can be done on common kiwi. As the plant is a very vigorous grower and at times, exceeds its boundary, so the vines require a heavy pruning. The pruning can even be done during the growing season. There are many cultivars with different good points. However Issai is considered to be the best. This is perfect-flowered variety and therefore does not a pollinator for setting a good commercial crop. Anna, earlier-ripening Geneva and Dumbarton are some other good fruiting varieties. Baby kiwi seems to be a promising new fruit for commercial orcharding. Though it is not known much yet, but still its cultivation has started beginning. 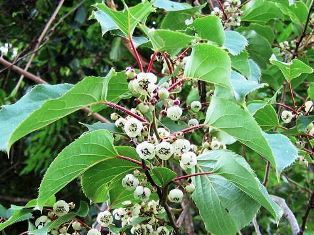 Attempts are already being made to bring this fruit under commercial production in South America, New Zealand, Europe, and Oregon and Washington in the United States. The fruits are available at some supermarkets in UK and USA.